I just published a review of Darcy Ingram’s book, Wildlife, Conservation, and Conflict in Quebec, 1840-1914. The review appears in H-Net Reviews here. You can download a PDF version of the review here. Wildlife conservation in Quebec was distinct from the rest of Canada not because of the province’s French Canadian heritage, but because of its British colonial heritage. This is the unexpected twist to Darcy Ingram’s insightful study of wildlife conservation advocacy and policy in Quebec from 1840 to 1914. By chronicling and analyzing the seemingly anomalous regional story of wildlife conservation in Quebec, this book makes a substantial contribution to our understanding of Canadian and North American conservation history. The key to the significance of Ingram’s work is not just his regional focus but also his chronological framework. To explain the origins of Quebec’s unique system of privately leased hunting and fishing reserves, which lasted until 1977, Ingram begins in 1840, earlier than most Canadian conservation histories. This book looks at both the period of the Progressive conservation movement of the late nineteenth and early twentieth centuries and an earlier period of conservation history in the mid-nineteenth century, beginning in 1840. In doing so, Ingram locates the origins of wildlife conservation in Quebec among an elite group of British and British American men whose social and political outlooks were informed by conservative, patrician values. These values, Ingram argues, were inherited from British (specifically Scottish) conservation traditions and practices. His analysis of Quebec conservation history, therefore, is sensitive to both its French Canadian and British colonial pasts, offering new insights with implications for a broader understanding of conservation across North America. Ingram opens his book with a biographical sketch of William Rhodes, a superb representative of Quebec’s British patrician culture. 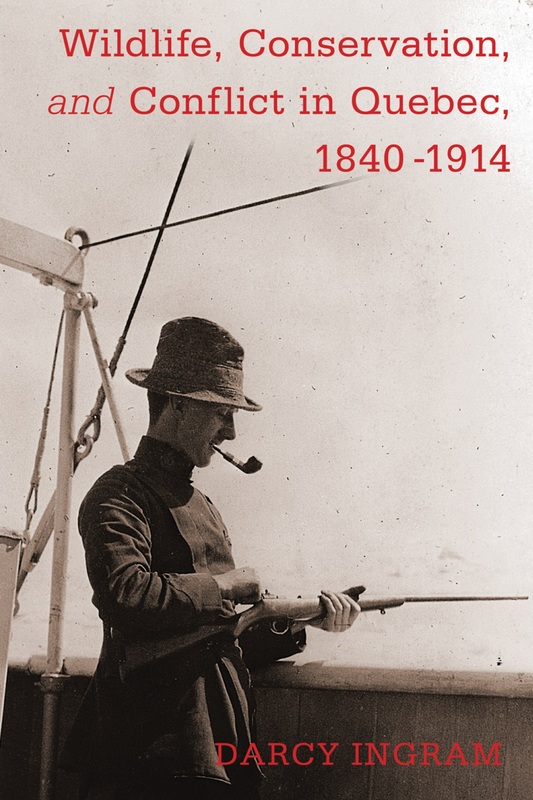 Rhodes and his contemporaries shared principles and practices of wildlife conservation that were rooted in a conservative vision of social order and the perceived responsibilities and privileges “familiar to upper-class English men and their colonial cousins” (p. 5). One only needs to look at the portrait of Rhodes on page 4 to understand the group of elite men Ingram follows in this book. Posed in an absurd fantasy tableau of a winter hunting scene—a decapitated stag and his bowing, subservient guide at his feet—Rhodes is the poster child of a group of late nineteenth-century middle-class Quebec sportsmen slavishly imitating the life of an imagined English gentry in the New World. In the first part of this book, Ingram examines the patrician outlook that drove the development of a unique system of private hunting and fishing leases that partially emulated aristocratic estates in Scotland. Interestingly, Ingram reveals that Quebec’s elite patricians did not seek to establish an exclusive monopoly over fish and wildlife resources solely for the purposes of sport. Instead, their outlook on wildlife incorporated a desire to improve environmental conditions so as to foster wildlife for a range of uses, including subsistence. They were also relatively sensitive to continued Aboriginal use of wild animals. Conservation under this model would be achieved through the private interests and leadership of Quebec’s anglophone elite. In the 1840s, prominent British and British American elites organized local conservation societies and associations in Montreal and Quebec that then lobbied the colonial legislature to establish leasing privileges to promote the conservation of fish and other wildlife resources. The subsequent leasehold system resulted in a series of private estates held by some of the most politically powerful elites in Quebec, including an exclusive lease reserved for Canada’s governors general. Wildlife resources were, according to Ingram, “thoroughly embedded in Quebec society” (p. 30). Straddling the boundary between the arable lands of the St. Lawrence Valley and the wilderness lands of the Canadian Shield, colonists in Quebec had long thrived on the interface between the relatively meager land that could sustain agriculture and the abundant land that could sustain wild animals. Hunting and consuming wildlife then was a long-standing tradition and vital element of household economies in Quebec. The consolidation of prior hunting and fishing regulations in the 1858 Lower Canada Game Act embodied the values (and anxieties) of Quebec’s elite patricians who sought to exert their social status to oversee the protection and improvement of these important wildlife resources. Beginning with the regulation of salmon fishing in the 1850s, the colonial government established a system of leasehold tenure on several rivers throughout Quebec. The government sold these “estate-like private holdings” to elite members of the colony’s capitalist classes on the condition that they uphold and enforce Quebec’s fish and wildlife conservation rules (p. 62). This system required leaseholders to hire fish and game wardens, construct infrastructure to support surveillance, and bring charges against any violators of conservation laws. According to Ingram, this “public-private partnership” would be the model of conservation policy in Quebec until the 1970s. While the model fit with many of the goals and objectives of Quebec’s mid-nineteenth-century elite patricians, it was not an effective means of enforcing conservation law. Ingram ably demonstrates the pervasive resistance to conservation law in Quebec throughout the period from the 1850s to the 1880s. Wildlife resources remained central to household economies and the leasehold system simply could not offer anything close to omnipresent surveillance. Conservation law may have attempted to marginalize previously legitimate uses of wildlife in Quebec, but the limits of enforcement meant that hunting and fishing continued to be part of everyday self-provisioning practices among ordinary rural people in the province. Ingram identifies the period from 1880 to 1914 as the second part of his conservation history of Quebec. This period is most commonly associated with the emergence of the Progressive conservation movement in North America. Ingram shows how the conservation ideals of Quebec’s patrician culture of the mid-nineteenth century influenced wildlife conservation in the province into the next century. This left Quebec with a unique jurisdiction in North American conservation. By the 1880s, a new group of elite sportsmen had inherited the leasehold conservation system and some of its patrician values. Middle-class urban sportsmen and their clubs and associations built on the work of the earlier generation of patricians to expand the province’s system of private fishing and hunting reserves. By the end of the nineteenth century, that system covered more than twenty-three thousand kilometers, more than four times the size of Prince Edward Island, according to Ingram’s figures. They took up the work of fish and game conservation along with the expenses and duties. This second period of conservation policy in Quebec similarly led to conflict with rural inhabitants and Aboriginal people who continued to utilize wildlife for commercial and subsistence purposes. However, the middle-class urban sportsmen of this period were less inclined to be sympathetic toward such uses of wildlife. Ingram also identifies another disaffected faction in the wildlife debate, ordinary sportsmen who were excluded from the elite clubs and associations that held most of the private leases. They found sympathy among their compatriots outside of Quebec who viewed the private leasehold system as undemocratic and elitist. As jurisdictions outside of Quebec developed public wildlife reserves, national parks, and regional parks, the province eventually found itself isolated in the continental conservation movement of the late nineteenth and early twentieth centuries. Quebec was set apart and would remain so for most of the twentieth century until the Parti Quebecois, a nationalist separatist government, eliminated the leasehold system in 1977. Ingram’s book builds on recent research in Canadian conservation history. As with George Colpitts’s Game in the Garden: A Human History of Wildlife in Western Canada to 1940 (2002) and Tina Loo’s States of Nature: Conserving Canada’s Wildlife in the Twentieth Century (2006), Ingram demonstrates the role of non-state actors in the development of wildlife conservation policy. Ingram also takes a cue from John Sandlos’s Hunters at the Margin: Native People and Wildlife Conservation in the Northwest Territories (2007) by analyzing the effects of conservation law on Aboriginal people and rural Quebecers and its use as a tool of colonization. His book, however, adds much to all of these previous studies by shifting both the regional and temporal focus of Canadian conservation history to an earlier period in the eastern half of the country. Wildlife, Conservation, and Conflict in Quebec, 1840-1914 leaves many open questions worthy of future research. While Quebec developed a unique system of conservation based on private leasehold reserves, did this approach to wildlife conservation influence policy outside of Quebec? In particular, it would be valuable to know how the neighboring province of Ontario responded. How did the private leasehold system change in the years after 1914? Did it stunt the development of public game reserves? Did it spread into Quebec’s provincial north after 1912 when the province acquired territory extending to Hudson Bay and the Subarctic? Did the provincial government establish a concurrent public system of wildlife conservation? These unanswered questions are a reflection of Ingram’s thought-provoking and insightful findings in a book that will, one hopes, inspire new research and new knowledge about the development of wildlife conservation in Canada. Citation: Sean Kheraj. Review of Ingram, Darcy, Wildlife, Conservation, and Conflict in Quebec, 1840-1914. H-Environment, H-Net Reviews. March, 2015.